Fiona Campbell: Somehow, you do not look like the sort of lad who'd be thinking of settling down. Tommy Albright: I didn't say that. I just said I was thinking of getting married. Arthur Freed and Vincente Minnelli combined talents on numerous occasions to make several excellent MGM musicals. The two men knew how to mobilize a film cast and crew to bring the luscious music and lyric of Frederick Loewe and Alan Jay Lerner to life. Though Brigadoon is not their best work, it has an endearing charm thanks to the remarkable skill of the talent that joined forces to make it. Based on the Broadway smash-hit musical, the story centers on two men from New York who venture into the highlands of Scotland on a hunting trip. As the fog descends upon them, Tommy Albright (Gene Kelly) and his sarcastic friend Jeff Douglas (Van Johnson) become lost in the middle of nowhere, but stumble upon an unmarked town: Brigadoon. There's something odd about this town—and, no, it can't just be attributed to the fact that it's populated by dancing Scots. Hardly anyone will speak to them when they enter MacConnachy Square. Our New Yorker friends catch a break, however, when Charlie Chisholm Datrymple (Jimmy Thompson) invites them to join the town's celebration of his forthcoming wedding to Jean Campbell (Virginia Bosler). Tommy and Jeff take a few swigs of ale and then...well, let's just say that their elaborate tap dance to the tune of I'll Go Home with Bonnie Jean is the rule, not the exception. The heart of this musical is a love story, between Tommy and the beautiful older Campbell sister, Fiona (Cyd Charisse). Despite having all of the material success in the world, Tommy is unsatisfied with his modern life. The down-to-earth Fiona becomes his perfect match and they fall in love almost instantly, as they dance a graceful ballet while picking heather from the town's hills. Yet, when Tommy tries to take Fiona across the town's boundary to get more heather, she refuses and runs away. Tommy seeks an explanation and, with the aide of Mr. Lundie (Barry Jones), Fiona yields a secret. The story is fairly obvious and the plot twists totally predictable, but Minnelli's staging of the musical numbers and Kelly's choreography are likely to sweep all musical-lovers off their feet—or, at the very least, lead to some satisfied toe tapping. It is likely that there will never be musicals like Brigadoon ever again. A director would never be allowed to hold a shot as long as Minnelli does to reveal the immense skill of Kelly and Charisse. Editing can help hide the lack of dancing talent exhibited by the likes of Renee Zellweger and Catherine Zeta-Jones, but it can't replace the beautiful motions created by these two gems of the silver screen. Each dancing number is infectious, especially The Chase (created specifically for the film version), which features fantastic camerawork that makes me wonder how anybody can watch something as dreadful as Moulin Rouge when this is available to them in the glory of CinemaScope. Adding to the joy of watching this movie is the performance by Van Johnson. His dialogue is wickedly funny, especially in scenes where he has to fend off an aggressively forward goat herder (Dody Heath). His timing and impeccable skill of playing the alcoholic best friend make up for Kelly's less than stunning acting performance. Kelly, though in tip-top form as a dancer, appears to be phoning this performance in, which is about the only downside to the whole movie. Though it doesn't live up to the great MGM musicals like Singin' in the Rain, An American in Paris, and—in my opinion the best cinematic musical ever made—Gigi, Brigadoon still hits all the right notes and is a refreshing reminder of the filmed musical...an art that is almost entirely lost in the 21st century. Image Transfer Review: The original DVD of Brigadoon sported an anamorphic 2.35:1 transfer, but this re-release is worth a double dip alone for the new transfer in the film's original aspect ratio of 2.55:1. The CinemaScope picture is rendered well here, though there are some print defects and certain shots towards the beginning are slightly grainy. Colors and details are vivid and there's strong depth, helping to create a film-like look. Skintones are accurate and contrast is excellent. It appears that the flaws in the image are probably a result of poor film storage over the years. Audio Transfer Review: Accompanying the new image transfer is a brand new Dolby Digital 5.1 mix. The surround speakers feature the musical score and some of the chorus, but for the most part this is a front heavy show. Even when the surround speakers are used, they tend to be mitigated by the front soundstage. Directionality and sound separation are fairly infrequent, but the music comes through strongly and it's a clean sound. A French mono track is also available. Audio Outtake: There but for You Go I!—a recording of Gene Kelly singing a song that did not appear in the finished film. Extras Review: Extras are slim on this release, but those that are included make for some fun viewing. There are three deleted musical numbers, shown in nonanamorphic 2.55:1 widescreen with Dolby Stereo 2.0 sound. The songs—Come to Me, Bend to Me, From This Day On, and Sword Dance—can be played together for a combined runtime of 11 minutes, 10 second. Each is fine on its own, but they may well have been wisely cut from the final product due to pacing reasons. Regardless, all three continue the magic of the story. There's also an audio outtake of the song There But for You Go I! (04m:15s), sung by Gene Kelly. It's an okay listen, but it would be much more fun to see it performed. Finally, the original theatrical trailer is presented in anamorphic 2.55:1 widescreen. 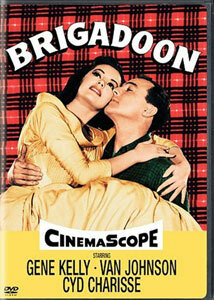 Warner does a fine job with Brigadoon, though it isn't a stunning release on its own. The newly remastered image (presented in its original aspect ratio of 2.55:1) is a much-appreciated update from the previous DVD, as is the new Dolby Digital 5.1 mix (though it is front heavy). Extras are scarce, but continue the mystical fun of the movie.